Wait Wait- Don't Tell Me! - Super Inky! Wait Wait- Don't Tell Me! Guess what I've been up to? That's right! I got to go to the taping of Wait Wait Don't Tell Me! (the NPR news quiz). 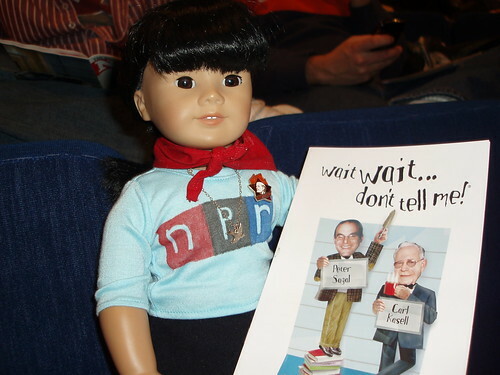 I got my own NPR t-shirt for the occasion. I was so excited! I've been listening to Wait Wait for almost 3 years now. It gets taped most Thursdays at the Chase Auditorium in Chicago, which is in a basement. When they're done with the show, they have to re-record the parts where the panel messed up. After that's all over, you can meet the celebrities! 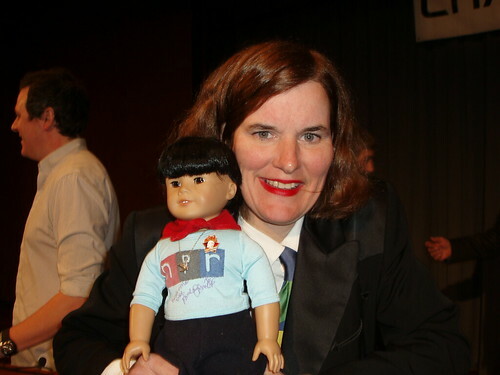 This is me with Paula Poundstone. She has such a fun voice! 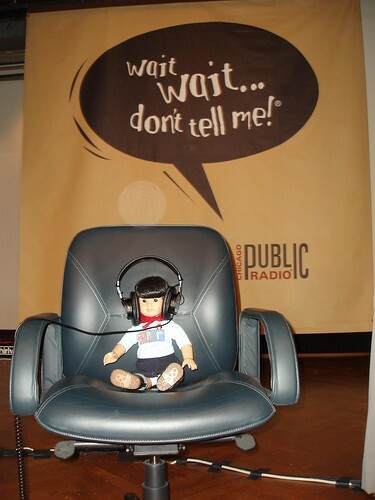 She is the best of all the panelists on Wait Wait. Paula signed the front of my t-shirt- can you see? I think I'm her #1 AG fan. Colette got her book, but she won't let me read it because I'm not old enough. 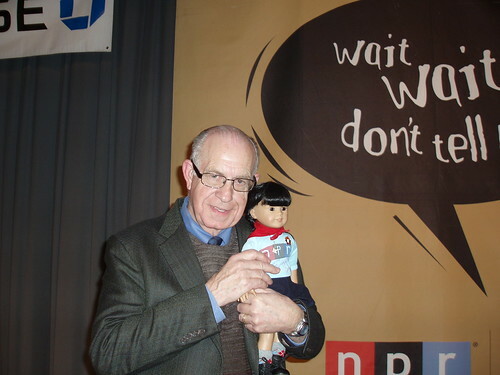 This is me with Carl Kasell! If you win on Wait Wait, Carl will record your answering machine message. Since I don't have a phone, a photo is much, much better. Here I am with Peter Sagal! He's the host. He also writes True Life Tales for the New York Times Magazine. 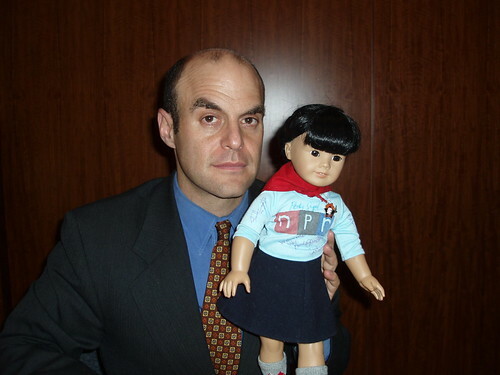 I am trying to look very sophisticated in this photo, but I think Peter Sagal looks a bit skeptical about meeting a doll! 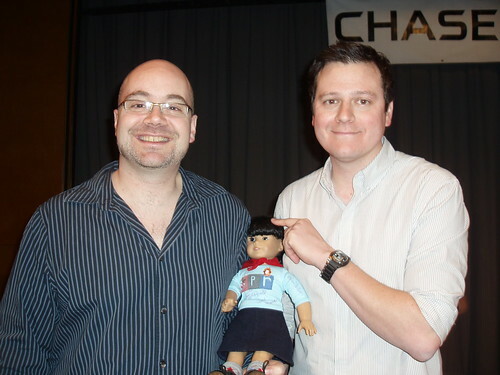 These are the other two panelists- Adam Felber and Luke Burbank. I have no idea what they do when they are not being panelists, but they are funny. Luke signed my t-shirt on the back, right above my bottom. He called it "tramp stamp." Good thing Violet's mama wasn't there! She wouldn't approve. 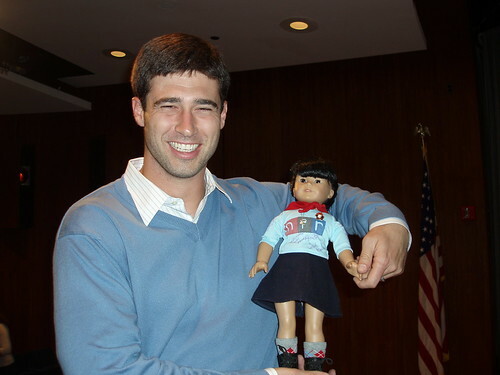 The celebrity guest was Joey Harrington. He's the quarterback for the Atlanta Falcons. He got that job because one of his teammates was doing very mean things to dogs and wasn't allowed to play anymore. Joey Harrington loves NPR, even if no one watching the taping knew who he was before he got introduced. After the show, his friends teased him for getting his photo taken with me. I got autographs from everyone! I am hoping I can go back to another taping and get some of the other panelists. Paula Poundstone will always be my favorite, no matter what. You get to meet so many celebs! Tía knows about that show and listens to it, but I don't really think I'd be able to understand it all. I mean she laughs a lot, but I'm not sure why.